On purely military terms, the 2007 surge in Iraq was pretty successful. But as a lot of people pointed out at the time, that success was due to more than just the surge itself. A lot of it was due to specific local conditions, which I usually added together and called The Four S’s (Surge, Sadr, Sectarian cleansing, and Sunni awakening). Those additional conditions never existed in Afghanistan, which made the surge there a lot more difficult. 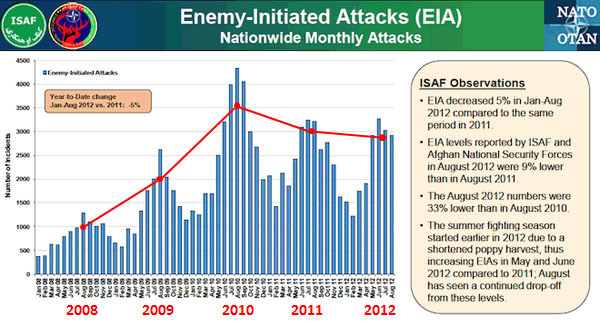 The chart [below, with red line added] measures the various attacks the Taliban and associated insurgents launched against NATO forces, month by month. In August 2009, the peak of the fighting season and the height of the internal Obama administration debate over a troop surge, insurgents attacked U.S. and allied troops — using small-arms fire, homemade bombs, mortars and more — approximately 2,700 times. In August 2012, they attacked just shy of 3,000 times. Perhaps Obama should take a hint from Apple CEO Tim Cook, who said today that he is “extremely sorry” for subjecting his customers to a new, bug-ridden maps app. Obama ought to be sorry too.